The NRA has decided that, in order to distract people from calls for stricter gun control laws, they will instead vilify one of the right-wing's favorite targets — the mainstream media. "The mainstream media love mass shootings. 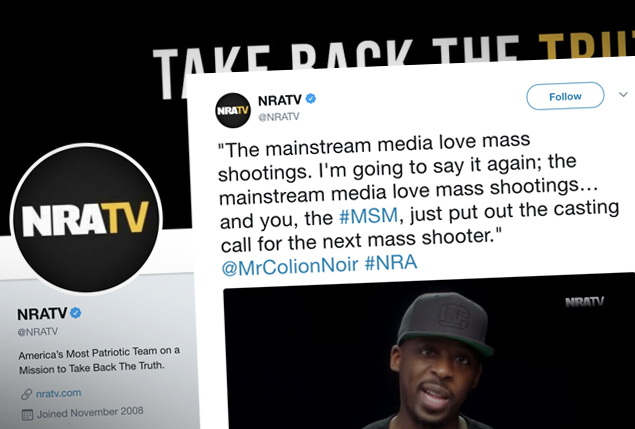 I'm gonna say it again: The mainstream media love mass shootings," Colion Noir, a gun rights activist and lawyer who hosts a web series on the NRA's online video channel, declared in an NRA video released Thursday. "Now I'm in no way saying that people in the media wish for the deaths of innocent people. I don't believe that at all. But the truth of the matter is, if there's one organization in this country that has a vested interest in the perpetuation of mass tragedy, it is our mainstream media." He added, "The dirty secret is mass shootings have become their 'Game of Thrones,' their 'House of Cards,' their 'Seinfeld' and their 'Friends' all wrapped into one. And whenever they get one? They wring out every last episode they can to juice their ratings and push their agenda, because tragedy is their business model." Noir also accused the media of being racially motivated in the shootings that it covers, arguing that it wouldn't cover violent crime in Chicago because the victims are "just a bunch of black kids no one cares about anyone." He also implied that the media has an anti-gun agenda when he said that they wouldn't cover armed citizens who thwart violent crimes. Noir's sentiments were repeated by NRA spokeswoman Dana Loesch during her appearance at CPAC on Thursday morning. "Many in legacy media love mass shootings. You guys love it," Loesch declared during her speech. "You love the ratings. Crying white mothers are ratings gold." Loesch claimed that for the media, "if it bleeds it leads, but it has to be the right people in the right communities at the right time." Yet the NRA, in addition to adopting a right-wing agenda on racial issues in the 1970s, has also attracted controversy for not standing up for the firearm rights of minorities like Philando Castile. Taking her agenda even further, Loesch announced that she will launch an NRA TV show in March so that she can further attack the mainstream media. Loesch has been responsible for promoting a number of controversial defenses for the NRA after high profile mass shootings. Following the San Bernardino shooting in 2015, Loesch pinned the blame on everyone from the media and Hollywood to global elites and campus protesters. She repeated her vilification of the media last year in an ad which claimed that liberals "use their media to assassinate real news. They use their schools to teach children that their president is another Hitler. They use their movie stars and singers and comedy shows and award shows to repeat their narrative over and over again . . . and then they use their ex-president to endorse the resistance."